Everyone loves a backyard barbecue, especially when you don’t have to do any prep, cooking or clean up! That’s why you and the whole family should join The Chopping Block for our upcoming Summer BBQ Bash on Sunday, July 8 from 4pm-7pm. It will be the perfect way to wrap up a holiday week! 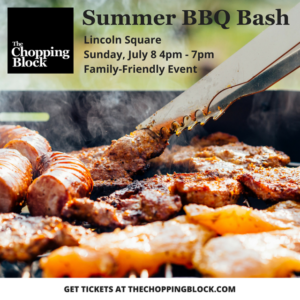 For one evening, we’re transforming our entire Lincoln Square location into a fun, festive, family-friendly barbecue. You’ll enjoy an evening full of elevated classics, as you learn how to recreate the dishes at home with the help of our professional chefs. You’ll travel from room to room, including our outdoor patio, tasting and learning all about the art of smoking, grilling and barbecuing from our chef-driven demonstration stations. To get your evening started, you’ll be welcomed with an appetizer spread featuring Crispy Andouille Hushpuppies, Pickled Cocktail Shrimp and Green Beans, and Watermelon, Haloumi and Mint Skewers. Watermelon can be one of those tricky fruits to cut. 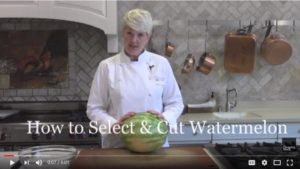 Our Owner/Chef Shelley Young demonstrates how to select and cut watermelon in this video. 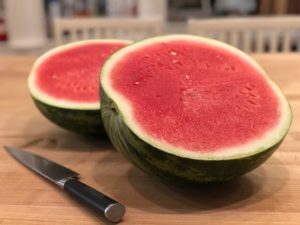 If you always seem to have leftover watermelon, here are four new ways to use the entire fruit, including the rind! In one night, you’ll learn how to make Pulled Pork, Beef Sliders, Beer Braised Brats, and Smoked Chicken Wings with White BBQ Sauce on our beautiful outdoor patio. You’ll then leisurely stroll throughout our indoor kitchens visiting multiple chef-led demonstration stations featuring Grilled Potato and Green Bean Salad with Rosemary Vinaigrette, Grilled Panzanella Salad, Macaroni and Cheese, Baked Beans, and Elotes. Wrap up the evening enjoying desserts featuring Mini Lemon Chess Pies, Grilled Seasonal Fruit with Mascarpone, and Mini S’mores Cupcakes. When signing up, you’ll have the option to select the right package for you: one that includes all of the food, or one that includes all of the food and access to our open wine and beer bar. We’ll be offering John Daly cocktails that will be available for purchase throughout the evening. This event is perfect for larger groups that want to get together and mingle, families, or anyone looking for some fun. This one-of-a-kind event will satisfy all of your cravings for incredible barbecue this summer! Click here to get tickets to Summer BBQ Bash.